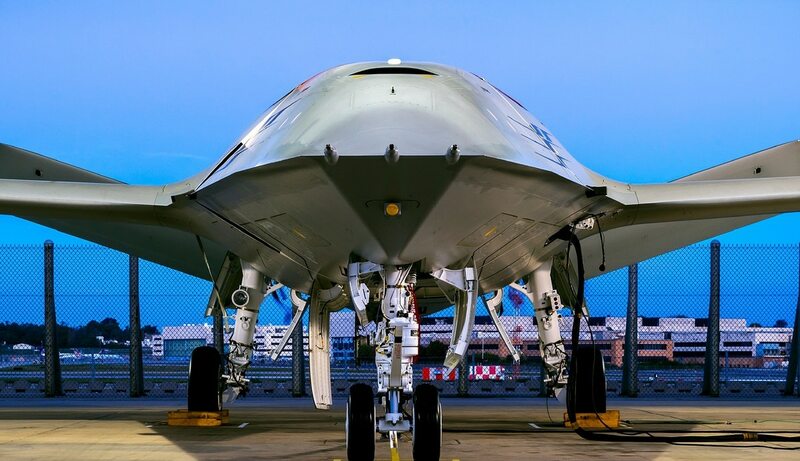 WASHINGTON — Boeing on Tuesday unveiled its entrant into the U.S. Navy’s MQ-25 tanker drone competition, a prototype wing-body-tail aircraft ready to begin tests this month. So far, Boeing has released one photo of the aircraft facing head-on to the camera, proving that the company has fabricated a prototype and that — as expected — it has moved away from the flying wing design it considered putting forward to the precursor of the MQ-25 program, when the Navy prioritized strike and ISR capabilities for its first carrier-based drone. “It’s an aircraft with the mission in mind, and we felt confident that the wing-body-tail design was the best for the refueling mission,” said Boeing spokeswoman Didi VanNierop, who added that the company incorporated lessons from its Phantom Ray unmanned demonstrator and other Boeing unmanned aerial systems. Revealed and ready! #BoeingMQ25 #UAS future @USNavy tanker will extend the range of combat aircraft from the flight deck to the fight! Boeing’s MQ-25 is slated to conduct engine runs by the end of the year at its St. Louis, Missouri, facility before moving on to deck handling demos early next year, the company said in a news release. During the deck handling demonstrations, the company will take the aircraft to the ramp, which will be marked to the measurements of an aircraft carrier’s flight deck, VanNierop said. There, operators will taxi the aircraft via remote control and move it within the confines of the deck. They will also validate that the aircraft will engage the launch bar of a catapult. However, the aircraft will not fly during those demonstrations, and Boeing has not set a date for first flight, she noted. Boeing has stoked conversation about its “mystery aircraft” for about a week. On Dec. 14, the company posted a short video of a stationary aircraft draped in a drop cloth on its Twitter account. “Robust? Check. Ready? Check. Changing future air power? Check it out!” read the caption, which then implored viewers to come back on Dec. 19 to see the plane’s reveal. Changing future air power? Check it out! Some aviation enthusiasts correctly guessed that Boeing would debut its MQ-25 offering, but others speculated that the new Phantom Works aircraft could be a new version of the Bird of Prey subsonic stealth aircraft, its Phantom Ray unmanned combat drone or even a new collaboration with Aurora Flight Sciences, which the company acquired this year. Boeing is the first of the MQ-25 competitors to formally show off a prototype aircraft. General Atomics has published concept art of its MQ-25 — seemingly based on its Avenger UAS, which bears a strong resemblance to the MQ-9 Reaper — and has mounted an intensive advertising campaign featuring a rendering of the aircraft. Lockheed Martin and Boeing have also released concept art of their offerings, but both opted not to show the full aircraft. Instead, the images show the refueling pods of each UAS connected by probe and drogue to a fighter jet. The Navy issued its MQ-25 request for proposals in October with proposals due Jan. 3, and the service plans to downselect to a final vendor in summer 2018. From there, the Navy will purchase an initial buy of four systems before deciding whether to continue on with a 72-aircraft buy, Rear Adm. Mark Darrah, program executive officer for unmanned aviation and strike weapons, told Aviation Week. Competing aircraft must be able to deliver 15,000 pounds of fuel to fighters up to 500 nautical miles away from the carrier. In October, Northrop Grumman unexpectedly dropped out of the competition — a move that surprised experts who had long held that Northrop’s X-47B was the favorite in the competition, as the company had already demonstrated it could conduct flying operations from a carrier. Northrop’s departure signaled to some analysts that the Navy’s requirements could favor wing-body-tail designs, not the flying wings thought to be proposed by Northrop and Lockheed. Phil Finnegan, a Teal Group analyst who studies UAS, told Defense News in October that Northrop’s exit could pave the way for Boeing to be the new front-runner, given the company’s extensive experience in naval aviation. “Boeing is expected to use parts that are used by the F/A-18 in a bid to keep costs down. It also has considerable experience with tankers since it builds the Air Force tanker,” he said.